Actually I would say EVERYTHING (so far), points to pilot error. Hard to see unlit buildings in the dark; and at a small airport, including their actual destination, it’s just not lit up at night the way a large city airport is illuminated. Runway numbers may not be very clear at night either, it’s not like they’re backlighted. And were they old and not very clearly painted anymore, or maybe partly obscured by dirt, dust or snow? So less visual clues in the dark than during the day. The FMS database only holds airports that are considered usable based on length and other parameters. I doubt that this airport was in the database and with that being the case, they could not have entered the wrong destination into the CDU in the first place. The one thing I can guarantee is that the pilots had no intention of landing there, most certainly making this pilot error. Dear Flying Engineer: very nice technical analysis of the Southwest incident. But with a surreal conclusion…. If this was not caused by pilot error, what else can be called so??? Anyway, let’s wait for the official investigation report. Eager to know what happened in the deck! Not pilot error?? Wow, your technical analysis was good, but some things you point out as obvious, are trivial favors to commercial pilots. The deviation of the so-caled flight path, could be many things, if not just an errant graphic from flightaware. Those paths are not always accurate, let alone the crew could have been given direct to the RNAV IAF for RWY 14 to BKG. 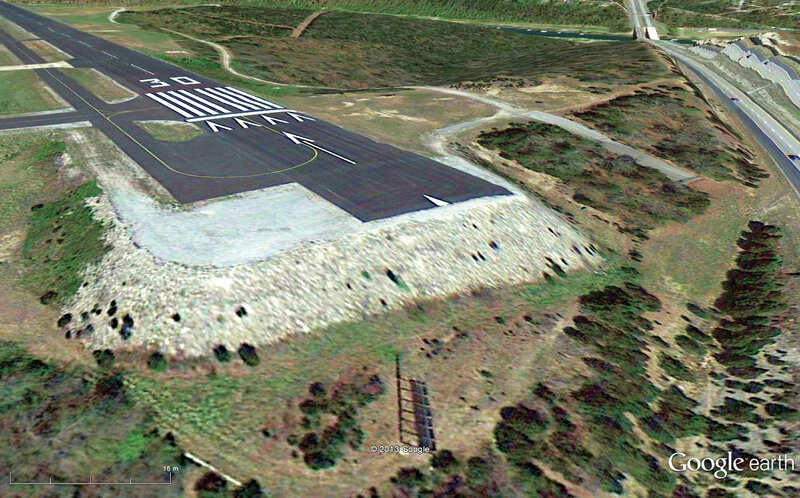 When you land at a wrong airport unintentionally, it is pilot error…..especially in a NG 737, or glass cockpit aircraft. I agree with Andy’s comments, above. The biggest mistake a pilot can do is to TRUST ONLY ONE…. Trust himself only Trust his eyes only Tust his senses only Trust his Crew only.History has shown again and again whenever only one instinct is trusted it results in a disaster.Be it the AirFrance or Be it the Korean 777 or the Egypt Air. Lets go Back to the basics… Where am I.. Why am I here.. 3 Reasons I am where I think I am. There rarely exist writings on the ground which tell us where we are. Under stress of getting the job done or to just get back home or get over with the duty cycle Human beings believe what they wish to. They choose to see what they are expecting to see. Human Factors ! . 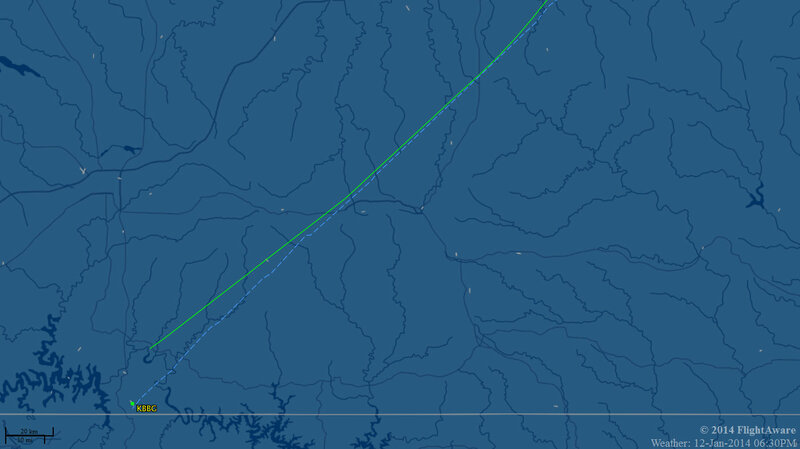 The 737 in question above continued the approach even though they were a full 20 Degrees OFF the Runway Course but for some weird reason they did Brake hard after landing?? Sorry, but I disagree completely. This looks like simple pilot/flight crew error to me. On the evening in question the expected landing direction at BBG would have been to the SE, RW 14. The flight plan would likely have been written and filed for a final segment of direct to the WUTIB intersection,which is the initial fix for the GPS approach to RW 14 at BBG, then direct BBG. The WUTIB intersection is just about 3 miles ahead of where the FlightAware actual track ends. Under the indicated wx conditions, a visual approach would have been the norm. The final approach from WUTIB to BBG RW 14 passes about 1/2 mile on the west side of PLK, That final leg into BBG crosses the final path for the GPS approach into RW 12 at PLK aright about the location of the final approach fix (GARYY) into PLK, about 4.9 miles NW of PLK RW 12 threshold. A very likely scenario would be a visual approach. If the flight had been proceeding to WUTIB, as they approached that intersection, they would have been about 13 miles from BBG, but only 8 miles from PLK. Looking to their left PLK would be appear to be in about the right place, and would be more visible. At 12-13 miles out they may not have even seen BBG (note that wx shows 10 miles visibility). If at that point they called airport in sight, they would have been cleared for the visual approach and transferred to BBG tower. With little else going on at BBG, they probably would have been cleared to land as they called in reporting on final. At that point they visually line up with PLK, thinking mistakenly that it is BBG. They continue the visual approach, apparently without the benefit of using the GPS approach for BBG RW 14, or cancelling the instrument setup because they think it is giving them an erroneous indication. A few keys that would have prevented their errant landing would include: final RW heading would be off by 26° (BBG RW 14 has a final mag heading of 143°, PLK RW 12 is 117°; using the GPS nav system for BBG RW 14 would have clearly indicated they were off course and way too low; missing the 4-light PAPI that sits on the left side at BBG, but not PLK. During the late final their altitude indication would have been way off – the TDZE elevation at BBG for RW 14 is 1275′; the TDZE elevations for RW 12 at PLK is 940′. There were many indications that should have clued them in, that they missed. But most significantly, they clearly did not use the available naviaids that would have told them they were way off. Just out of curiosity… why was this plane going to Branson, MO in the first place? That is not an official southwest destination.